1) High temperature in machines refrigerator. 2) Machines oils low pressure. 3) Waters ellipses or pressure in the pumps export pipe. By the time switch we selected the machines operation time after this the machineextinguishes automatically. 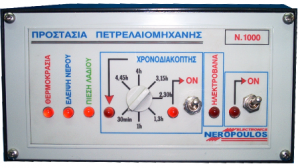 We first place in operation the machine and then appliance so that it goes uppressure of oil and water in pump.When it exist command in one of the threecontrols units entries,the proportional indicator turns on and arms electrovalve that we have connected before oil pump and remains armed for 2min and extinguishesthe machine . After 2mn released agains oils flow and because pumps low pressuredoes not need vaporization , we do not have continuity electrovalve armed in orderto do not have consumption of battery.